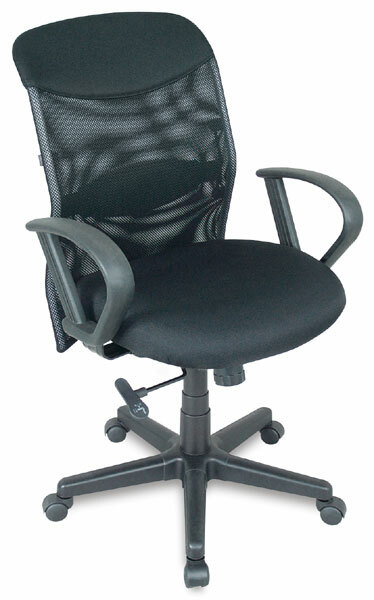 Affordability and luxury are combined in this sleek, black mesh back chair. It has a host of great comfort options, including lumbar adjustment, pneumatic height adjustment from 18" to 22", a vented mesh backrest, and a spring-adjusted tilt mechanism. It rests on a sturdy 24" diameter steel reinforced nylon base with hooded casters. The vented mesh backrest is 19" wide and rises 21" above the seat, with a spring adjusted rocking mechanism that can be locked into the upright position to maximize comfort. Padded lumbar support can be adjusted up and down according to personal preference. The 3" thick seat cushion measures 20" W × 19" D.